The pericytes of the testis are part of the omnipresent population of pericytes in the vertebrate body and are the only true pluripotent adult stem cells able to produce structures typical for the tree primitive germ layers: ectoderm, mesoderm, and endoderm. They originate very early in the embryogenesis from the pluripotent epiblast. The pericytes become disseminated through the whole vertebrate organism by the growing and differentiating blood vessels where they remain in specialized periendothelial vascular niches as resting pluripotent adult stem cells for tissue generation, maintenance, repair, and regeneration. The pericytes are also the ancestors of the perivascular multipotent stromal cells (MSCs). The variable appearance of the pericytes and their progeny reflects the plasticity under the influence of their own epigenetic and the local environmental factors of the host organ. In the testis the pericytes are the ancestors of the neuroendocrine Leydig cells. After activation the pericytes start to proliferate, migrate, and build transit-amplifying cells that transdifferentiate into multipotent stromal cells. These represent progenitors for a number of different cell types in an organ. 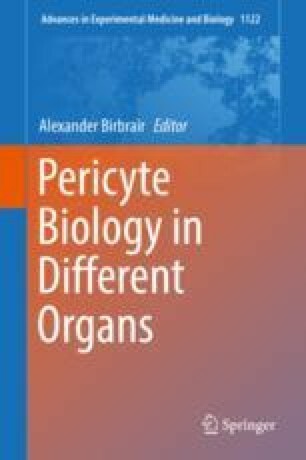 Finally, it becomes evident that the pericytes are a brilliant achievement of the biological nature aiming to supply every organ with an omnipresent population of pluripotent adult stem cells. Their fascinating features are prerequisites for future therapy concepts supporting cell systems of organs.